You might want to update that list of top Boston sports Tweets from 2013. Red Sox third baseman Will Middlebrooks posted a photo of himself and girlfriend/NESN sideline reporter Jenny Dell Tuesday night on his Twitter account. 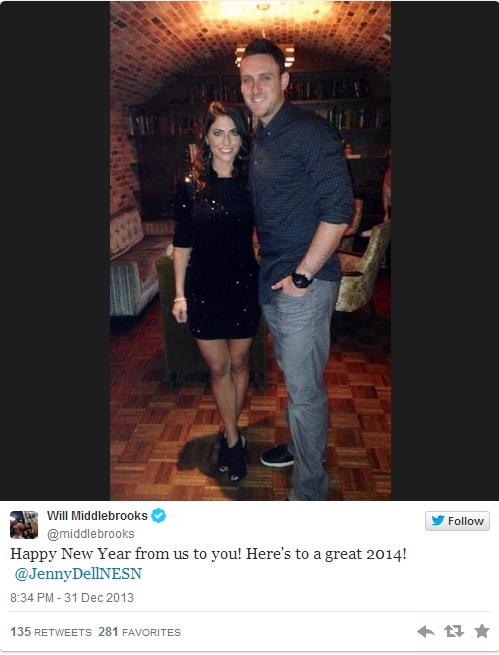 Certainly Boston's most notable sports power couple had plenty to celebrate in 2013 and plan on a bigger 2014. Dell is being courted by FoxSports1, the fledgling national network. This was the first photo of the couple shared on their Twitter accounts. Neither Dell nor Middlebrooks, who are living together according to the Globe, have made any public comments about their relationship. They apparently had a pretty good New Year's Eve. Wednesday, Dell posted several photos of the couple celebrating with, among others, St. Louis Cardinals pitcher and 2013 World Series Game 6 loser Michael Wacha. Truck Day is Feb. 8. Got a news tip, want to let me know directly what you think, or have a complaint or compliment, hit me up on our Obnoxious Boston Fan Facebook page, on Twitter @realOBF or e-mail me at obnoxiousbostonfan@hotmail.com. Don't forget to visit our Obnoxious Boston Fan blog. Thanks always for reading and pass the clicker.